#NerdsOnWheels: Road Trip to Meteor Crater! A little more than 48 hours ago, I piled into an RV with a few friends and fellow members of the Nerd Brigade, and we headed out to find an extraterrestrial…or at least, the remnant of one. Meteor Crater, the result of a 50,000-year-old impact, lies in the northern Arizona desert about 500 miles from Los Angeles. With a diameter of about 3/4 of a mile, it makes for an impressive reminder of how much energy is carried by space rocks traveling at planetary speeds. Brought to rest all at once, the ~50-meter impactor caused a gigantic explosion equivalent to a 20-megaton bomb, excavating the entire cavity, uplifting the strata under the rim, and flinging room-sized boulders great distances — all within a few seconds. Meteor Crater is certainly an imposing geologic feature, especially when you’re standing on the rim and looking almost straight down the rugged cliff face that forms the interior wall along most of the circumference. In size, however, it’s completely dwarfed by the immense craters on the Moon, the largest of which span more than a hundred miles (and impact basins are even larger). Despite this difference in scale, the features share a common origin, and the connection between the little limestone crater in Arizona and the pitted lunar surface is what defines Meteor Crater more than anything else. The process of impact cratering — the constant rain of scattered space debris leftover from cosmic collisions — is a fundamental tool of modern planetary science. Counting up craters on surfaces of different ages allows us to piece together a timeline for lunar geology, which can be tied to absolute rock sample ages derived from radiogenic isotopes contained in the Apollo moon rocks. This chronology gives us information about our own planet’s past to which we have no access here on Earth, having erased most of our early history through the steady recycling of the lithosphere known as plate tectonics. Even better, by calibrating the impactor flux and timeline derived for the Moon, we can gain insights into the cratering histories of other, more remote, planetary surfaces. Thanks to impact cratering, the lunar surface provides a window to our past and a link to the furthest reaches of the solar system, and the idea of using craters to unlock the secrets of remote surfaces lies at the heart of all kinds of current planetary research. As essential as it’s viewed now, however, the pervasiveness of planetary impact has only been widely accepted for a few decades, and the details of when and how it came to be seen as a common process could, and has, filled books. Meteor Crater, perhaps the best-preserved impact structure on Earth, has played a key role in the debate over lunar crater origins, which began with Galileo and the telescope in 1609 and stretched on through most of the twentieth century. 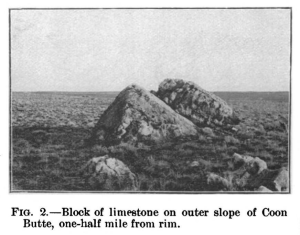 From the investigations of Grove Karl Gilbert in 1891, which led him to propose a volcanic origin for the crater but also inspired him to study the Moon, to the persuasive arguments of Daniel M. Barringer, who was convinced a fortune in meteoric iron lay beneath the crater floor, to the determined field studies of Gene Shoemaker, who kickstarted the Astrogeology Branch of the USGS and trained astronauts to think like geologists, thinking about the Moon meant thinking about the Earth, and Meteor Crater provided an analog for remote lunar features formed in a process impossible to witness. 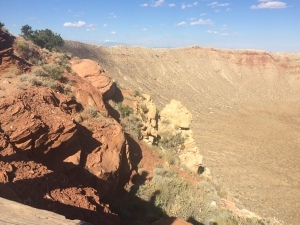 To visit Meteor Crater is to trace the history of this debate. Abandoned mining equipment litters the crater floor and rim, a tangible reminder of how our understanding of impact physics has changed from Barringer’s time to today. There is no vast hunk of iron buried beneath the crater; most of the impactor was vaporized and the rest scattered during the violence of the collision. My own interest in the history of crater interpretation centers around this fundamental insight, that the impact process is essentially an explosive one, unlike anything you might be able to replicate by throwing rocks — or even firing bullets — into sand or clay or lead. How do you study something you can’t observe directly? Do you make a model that’s as close as possible to the real thing, and trust that extrapolating will give you reliable information? Or do you look for an analog, something that you can study, and (again) trust that the differences between your analog and its counterpart are negligible? These questions fascinate me, and they play out in amazingly complicated ways throughout the crater debate, as various actors grapple with the evidence available to them and try to sort out what it all means. It’s tempting to try to fit this history into a narrative of monotonic progression from less knowledge to more, but the complexity of the situation belies such a simplified retelling, and that’s what makes it so compelling. It’s only one example, but all of the details of who knew what and how they reasoned it out, and whether they told anyone and if anyone listened — that’s science happening, and I want to know more. For all of these reasons, Meteor Crater seemed like a good destination for a Nerd Brigade road trip, and it’s certainly very close to my heart. Sharing a place so special to me with my science-minded friends felt pretty good. Just one question remains: where should we go next?! 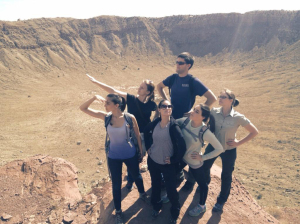 3 Responses to #NerdsOnWheels: Road Trip to Meteor Crater! Where next? Consider Upheaval Dome on the Island in the Sky in Canyonlands National Park, Utah. They’re pretty sure now that it’s an old meteor crater. I visited Meteor Creator back in 1956 between my jr. and Sr. years in high school it was quite impressive to me then, and not too far from the petrified forest national park, which is also an interesting place to a nerd, which I was back then and still am today though nerd was not the word that was used back then. this hole in the ground together with the others that have been found since should convince us all that the space program is not “a lot of our money being wasted in space”, but very necessary to insure that the human race survives at least until the sun expands to a red giant and burns up the earth. And then we will need to move elsewhere!